The Commission on Science and Technology for Sustainable Development in the South (COMSATS) and the Islamic Educational, Scientific and Cultural Organization (ISESCO) organized a national training workshop on “Repair and Maintenance of Scientific Equipments in Teaching, Research Institutions and Small Scale Industries” in Dakar, Senegal, from 18th to 21st October 2010. 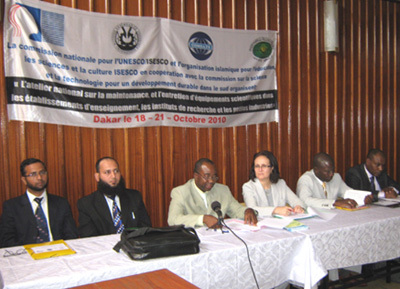 The workshop was organized under COMSATS-ISESCO Cooperation Programme (2010) in collaboration with the Senegalese National Commission for UNESCO. The main aim of this four-day workshop was to provide hands on training to the scientists, engineers and technicians in Senegal to become proficient in the repair and maintenance of scientific instruments in their respective labs. The workshop provided a forum for professional technicians, scientists, researchers, and service engineers to learn from Pakistani experts to repair their equipment themselves. The main components of the workshop included interactive discourses and practical training. The workshop was a master training programme to build indigenous capacity in the field in Senegal and the same experience will, in turn, be transferred from masters to others in their respective organizations in Senegal. Two experts from Pakistan Council for Scientific and Industrial Research (PCSIR), Pakistan, Mr. Arif Karim and Mr. Faisal Ghazanfar, provided training to the Senegalese scientists, engineers and technicians during the workshop. The scientific equipments used as subjects for the training included: spectrophotometer, chromatographic systems, transmission and scanning electron microscopes, HVAC Systems and PCR Systems. Around 20 participants benefited from the training. The workshop is expected to have developed an indigenous capacity for maintenance of scientific equipment used in the academic and research institutions as well as small-scale industry of Senegal, helping the country to pursue its scientific programmes more efficiently. It is hoped that Senegal would be able to develop its own Scientific Instruments Repair Centre for day-to-day needs of various scientific labs in the country.